Last year I missed out on the Denver Comic Con since we were in the midst of our home renovation. Paul exhibited solo and based on attendance as well as strong interest, I made a promise to attend this year. 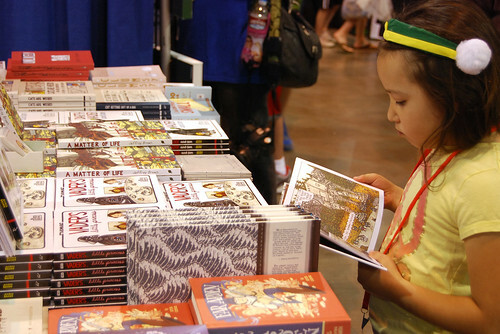 And it was even bigger than imagined, especially for a convention only in its second year. 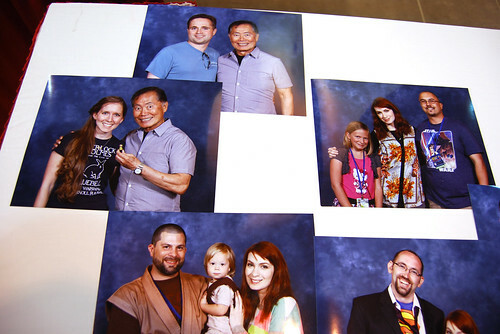 Denver Comic Con was held May 31-June 2. I opted out of flying out Friday so I could attend the San Diego County Fair Party that night. So with only a few hours of sleep under my belt, I flew in Saturday, went directly to the convention and was immediately greeted by costumed characters. While Denver lacks San Diego’s view of a harbor, it does has a sculpture of big blue bear peering into the convention center. The cosplayers were a familiar sight for me and it was fun to see a lot of folks in downtown Denver off guard. Even the ladies sharing the ride downtown from the airport in the shuttle with me were surprised our van was following a convertible with a blue Power Ranger riding shotgun. While the Denver Comic Con was big, it wasn’t nearly as big as San Diego Comic-Con; I could see one end of the hall to the other. 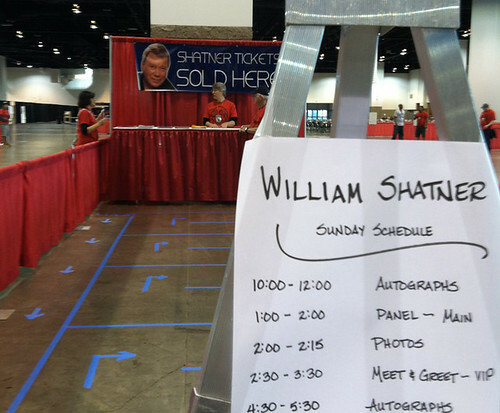 Aisles were crowded and tickets were sold out each day to the the disappointment of people waiting hours in line. 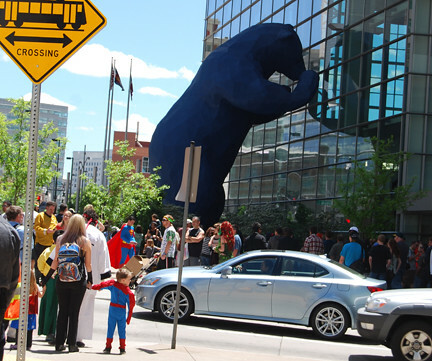 Paul estimated that several Denver Comic Cons could fit into one San Diego Comic-Con. But many people were enthusiastic and there seemed to be a steady stream of attendees. With the Rockies acting as a barrier from the typical robust Hollywood presence, this harkened back to the earlier days of San Diego— that attendees came here for comics. We sold out of some books we brought and Thoma Zahler of Love And Capes experienced the same thing: people were hungry for comics. Considering Denver has the largest population within 500 miles, people were coming from several states away. One person I spoke to flew out from Los Angeles to attend this convention because he couldn’t get entry into San Diego. Unlike San Diego, alcohol was served and consumed on the convention floor. Hard liquor was sold at various stands around the floor. 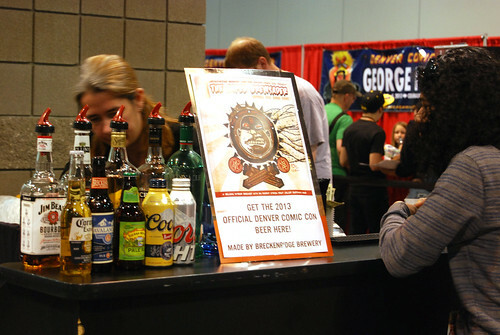 In addition, Denver Comic Con also had an official beer: The Caped Brewsader created by Breckenridge Brewery. Illustrations used in conjunction with the beer, literature and pint glass were designed by Australian comic artist, Ben Templesmith. 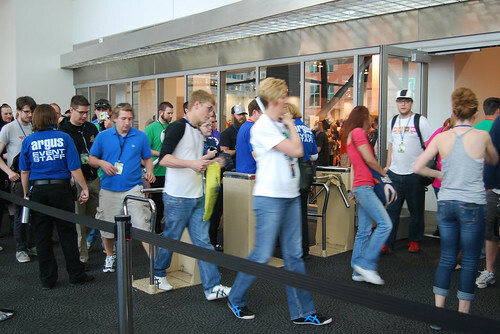 The jam to get inside the convention floor was one of many complaints about Denver; there was only one entrance into the hall. 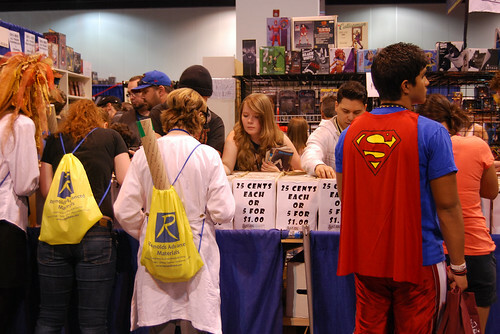 Aside from the panels at Denver Comic Con, the rest of the events were held on the main floor: fake sword fights, celebrities signings and live music. Upon speaking to PJ Perez, a friend who was also exhibiting at Artist Valley, the music from the Rock Band stage made talking to people throughout the entire weekend difficult. The unexpected attendance surge (Denver Post estimates the attendance at 48,000) combined with entry problems were the main complaints I heard. I’m hoping that next year’s convention can overcome some of these hurdles. Next year’s has already been scheduled for June 13-15. If you’re interested in attending, better buy your tickets now. Interesting that they serve beer at the convention center. I can’t imagine it happening at the San Diego one.